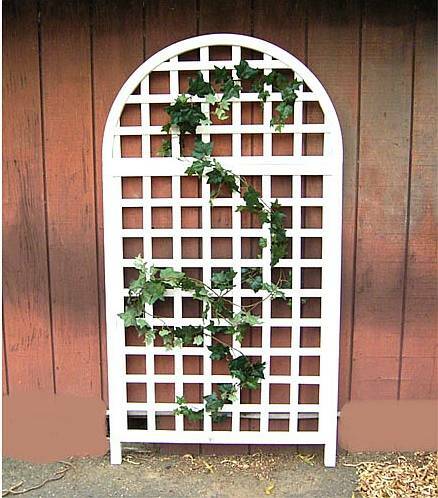 The Garden Arch Trellis is a simple and naturally beautiful way to bring climbing vines or flowers to your garden, patio, or to the side of your home. Wooden trellises are ideal for any size garden or yard; they provide an exciting vertical feature. They can also protect your home's exterior from the effects of climbing plants. Ivy and other climbers can slowly erode your home, especially the mortar between bricks. A garden trellis gives these beautiful plants a more convenient surface to which to cling. 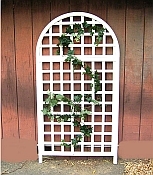 The Garden Arch Trellis is individually boxed according to UPS specifications and is easy to assemble. Available in White only.